Quick overview A doctor and physiologist, Griffith Pugh revolutionised almost every aspect of British high-altitude mountaineering, transforming the climbers' attitude to oxygen, the clothes they wore, their equipment, fluid intake and acclimatisation. Yet, far from receiving the acclaim he was due, he was met with suspicion and ridicule. This is the winner of the outstanding General Sports Writing Award, British Sports Book Awards. It is the winner of the Boardman Tasker Prize. It is the winner of the Mountain & Wilderness Prize, Banff Festival. It is the winner of the Tony Lothian Award, Biographers' Club. For the first time, drawing upon previously unseen diaries and letters, rare archive material and interviews, Everest - The First Ascent tells the remarkable story of Griffith Pugh, the forgotten team member whose scientific breakthroughs ensured the world's highest mountain could be climbed. A doctor and physiologist, Griffith Pugh revolutionised almost every aspect of British high-altitude mountaineering, transforming the climbers' attitude to oxygen, the clothes they wore, their equipment, fluid intake and acclimatisation. Yet, far from receiving the acclaim he was due, he was met with suspicion and ridicule. His scientific contributions were, quite simply, at odds with old-fashioned notions of derring-do and the gentlemanly amateurism that dogged the sport. Later in his career, his impact in helping athletes enhance their performance lasts to this day in the fields of cycling, swimming and running. This insightful biography shows Pugh to be troubled, abrasive, yet brilliant. 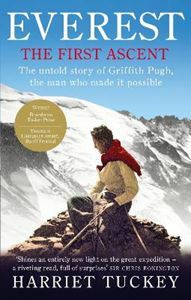 Eight years in the writing, closely researched, and told with unflinching honesty by Pugh's daughter, Harriet Tuckey, Everest - The First Ascent is the compelling portrait of an unlikely hero.